It’s time for another bedroom update! This room is slowly taking shape and turning into the dream bedroom we have wanted for years! It’s been so fun showing you guys each update as it happens, as opposed to just one final reveal. 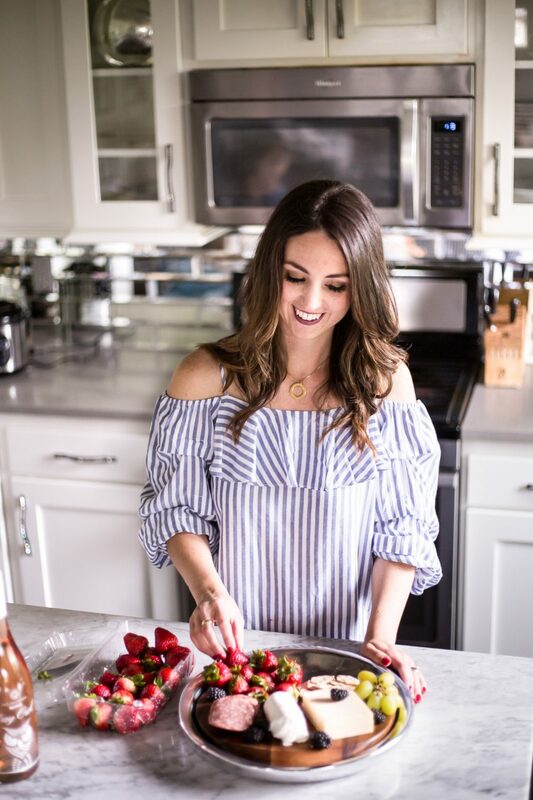 I think it’s good to show you that decorating a space is a process and with each new piece the room can take on a different look. 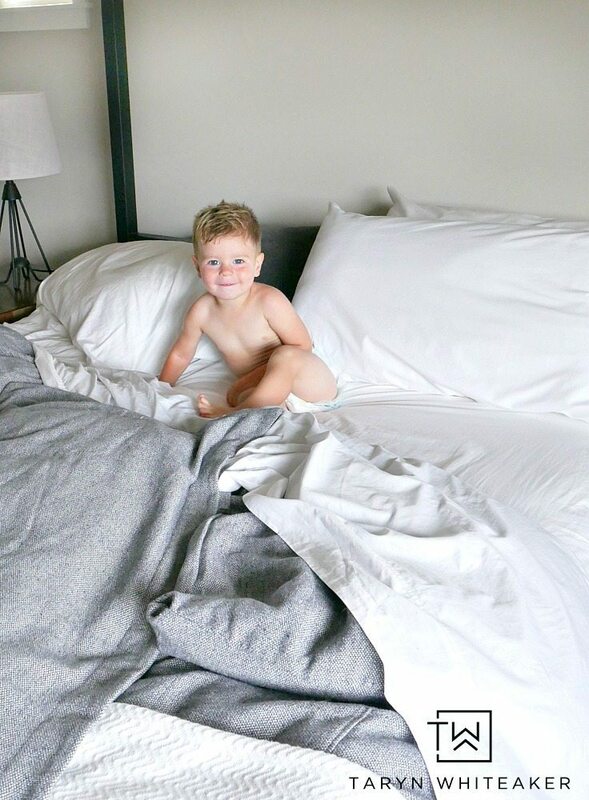 Today, I’m chatting all about our new bed frame and bedding from Room & Board! 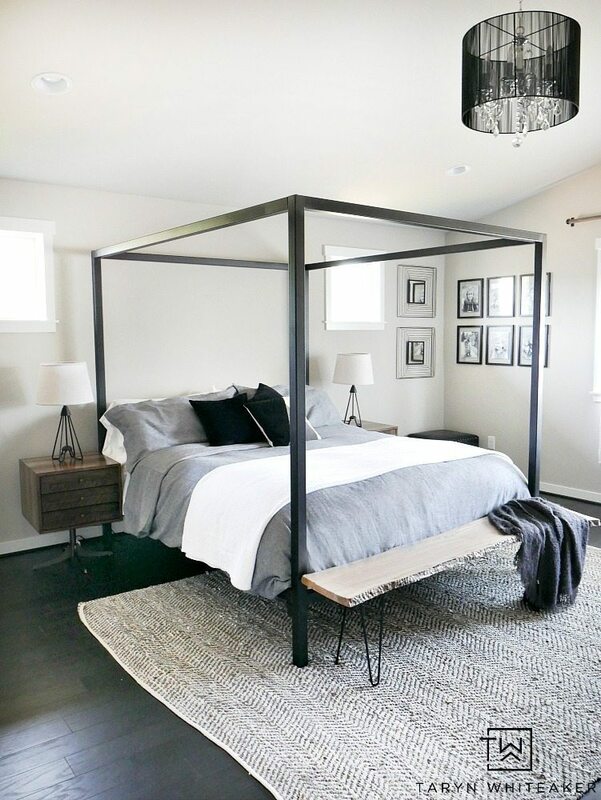 When we decided to decorate this space, for real this time, I had my heart set on a modern canopy bed. I wanted to take advantage of our vaulted ceilings and and also have a piece that made a huge impact in the room. And I finally found the perfect solution! The thing is, I knew the look I wanted in our bedroom. But who knew it would be so hard to find a canopy bed that fits a California King bed! I ended up finding EXACTLY what I was looking for at Room & Board . 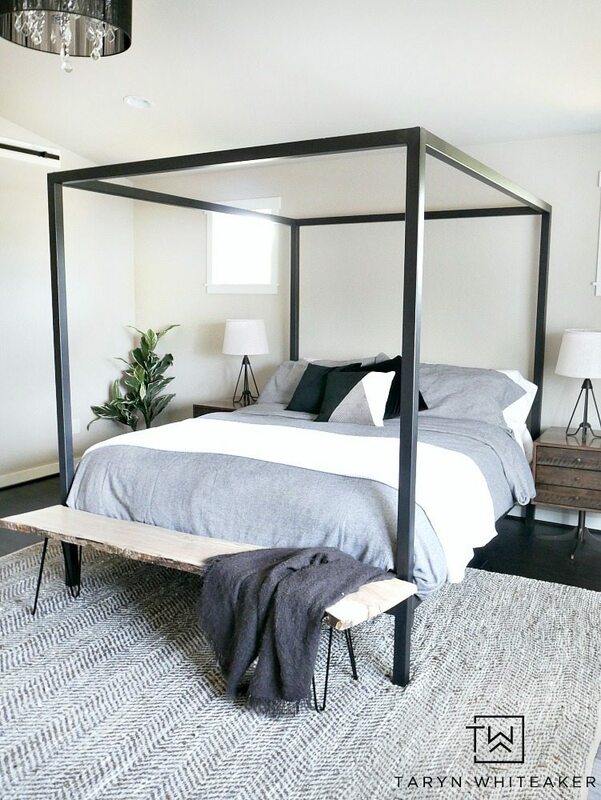 They have this gorgeous Architecture Bed in steel and I fell in love with it the second I saw it. 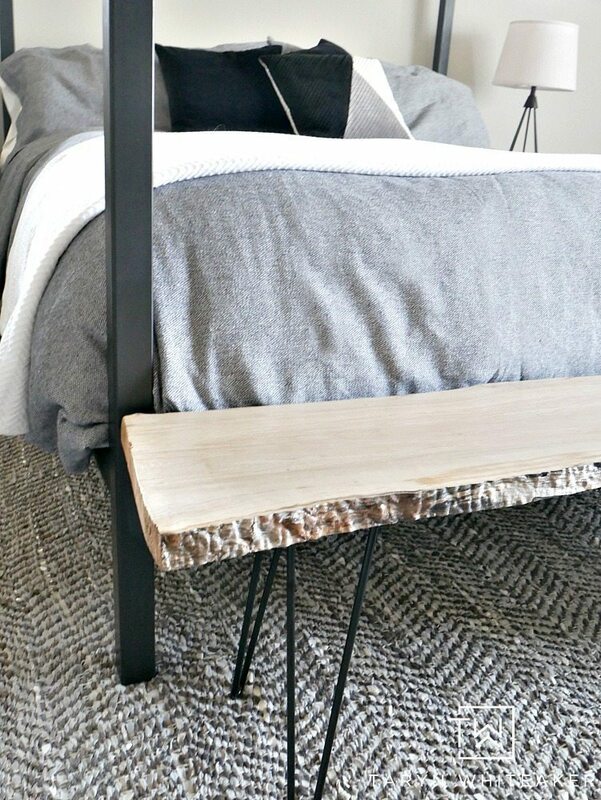 THIS is what I wanted for our rustic modern bedroom and it’s helping me pull together the look I have always wanted. The modern clean lines paired with tons of texture is what makes my heart happy. PS. If you like pops of color and like really bold looks, they now offer this bed in several bright colors which I think is super fun! I am so happy with this new bed. It is extremely sturdy and is probably the easiest bed to put together. Seriously, SO simple. Room & Board will typically put everything together for you upon delivery but we ended up putting it together ourselves once our room was all cleared and it took minutes. We we really impressed with the easy install and quality of this bed. It’s worth every penny. The only thing I will say is that we ended up not needing our boxspring anymore once we moved to this bed. The standard height is plenty high with just a mattress. It might make a difference that we have a pillow top so it’s a little thicker. But I just wanted to give you a heads up. Now let’s chat bedding!!!! You guys know by now that I am all about mixing textures in neutral colors and this room is no exception (in fact stay tuned for even more updates using texture in this space). I went with the Covington Duvet Cover and Shams in Marine Gray paired with Sateen Sheets in White and a white herringbone blanket. This duvet is made in a very heavy, high quality fabric with beautiful detail stitching. It is a blend of a cool medium gray color with very tiny black and white speckles. It is heavy, but also soft and so incredibly cozy. The perfect duvet for those cool months when you just want to curl up in bed (or any time of year if you have AC!). Just look at that beautiful texture on this white blanket. It’s also a very heavy and thick blanket that is made to perfection. It’s going to be my go-to blanket to curl up with once our fireplace is done in here! Now let’s pull back for a larger room view to see how everything is coming together! 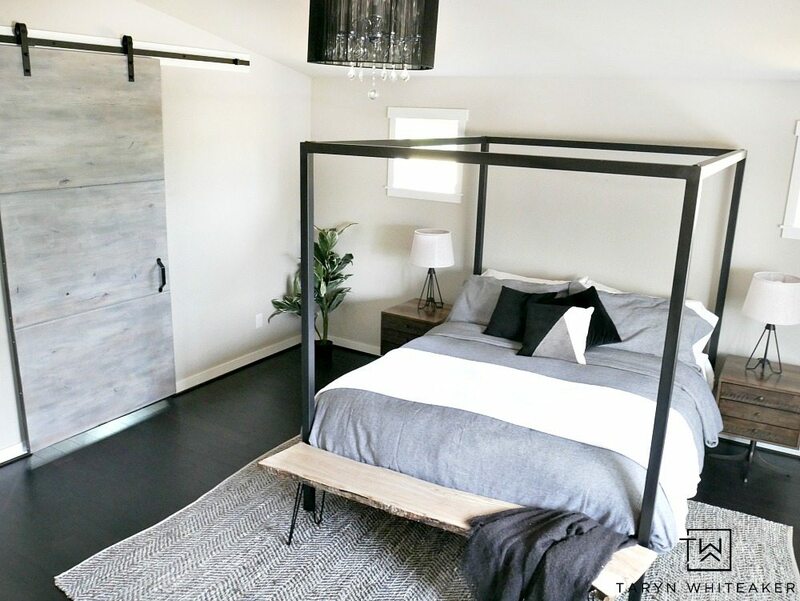 The bedding and steel frame are looking so good with our new modern barn door. I can’t wait for the rest of the room to come together. And all of you are probably wondering, ‘well it looks pretty but what’s it like to sleep in it’. Well, does this kid’s face tell you anything?! It’s amazing. Those sheets and baby snuggles, the best. 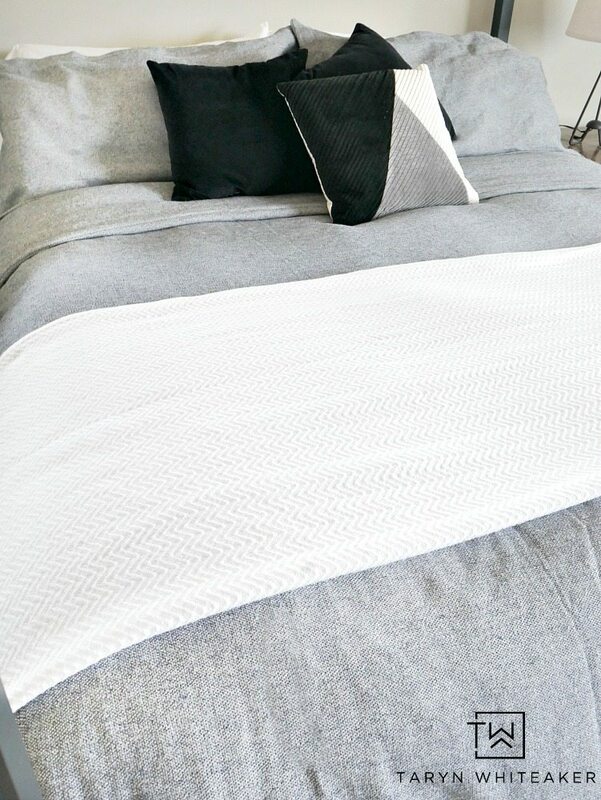 I am really particular about my bedding, there is nothing better than that feeling at the end of a long day when you crawl into an incredibly soft, but crisp and clean bed and these Sateen Sheets in White are perfection. They are incredibly soft but also cool to touch and are so refreshing to slip into. I can’t rave about Room & Board enough, they produce incredibly high quality products and their customer service has been top notch to work with. 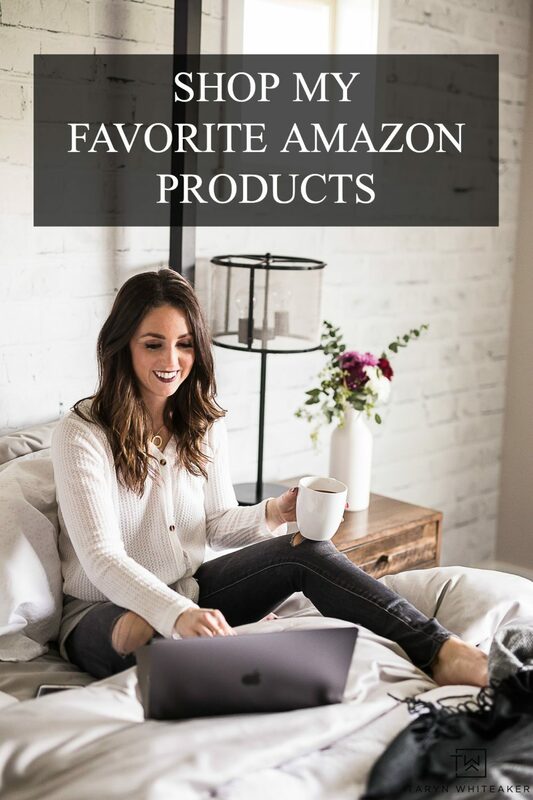 Definitely head over to their site and browse through all of their gorgeous home offerings. Your room looks so serene and peaceful! Would you mind sharing the source for your rug? It complements the room so well! Awesome bed Taryn, bedding and all. If you wanted to in winter could put curtains up all around the bed, cozy. Our bed had portable poles which could be up or not. When we moved to KY our room was 1/2 size smaller than room in MT house so took poles out, think they got thrown away. Thought would hate small room but it was so cozy, I spent a lot of time alone there, hubs on the road. Your room is quire roomy, makes it so nice for arranging furniture. And your little guy couldn’t be cuter, reminds me of my boys as little fellas..
Love your new bed and that rug. Enjoy it all. Love it! Can I ask how comfortable the bed is against your back when you’re sitting up, say reading at night? Thanks! We have really comfy pillows and as long as I have them behind my back it hasn’t been an issue at all. This bed is so sleek! I love the clean lines! And the bedding you chose complements it perfectly. Thanks for sharing with Merry Monday last week! It is looking good! I love those mirrors in the right corner, can you please provide the source? Thanks! I’m a newly wed and my hubby isn’t too thrilled about having an all white bed. 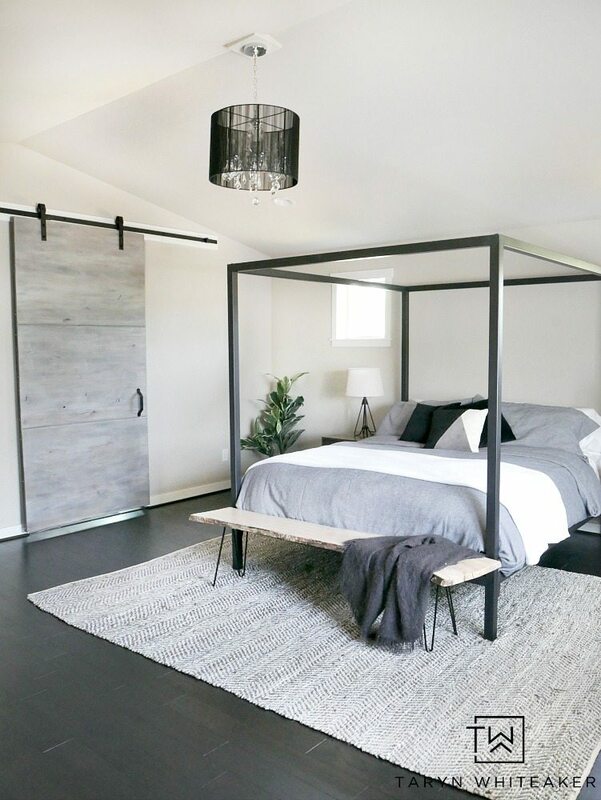 I do like the industrial look of your bedroom and I think it’ll will be a good compromise it’s stylish and not too girly ;) I just bought sheets in the Bahama Blue color from cariloha.com and hoping I can recreate the look with the same duvet set. Thanks for the awesome idea!